'Now Walks Like Others' film available on our video page. The British Society for the History of Paediatrics and Child Health (BSHPCH) was established by Professor Peter Dunn in 2002. It arose from the History Section of the British Paediatric Association, The latter having metamorphosed into the Royal College of Paediatrics and Child Health in 1996. The Society has continued to have a close relationship with the Royal College of Paediatrics and also with the British Soc﻿iet﻿y for the History of Medicine. The aim of the Society is to stimulate and advance the development of individuals and groups on the emergence and development of all factors related to the management and well-being of infants and children. The Society does not restrict membership to any single professional group but is open to all with an interest in child care. The main groups at present are medicals and historians. Admission to the Society is on completion of an application form which should be sent to the address on the form. The subscription is £20 per year. The Society Pattern of Events is at present a meeting during the Annual Conference of the Royal College of Paediatrics and Child Health and an autumn meeting, including the AGM, at a centre in the British Isles. This is held on a Friday and a Saturday. A short background on aspects of the development of the Paediatric specialty which now has many branches is given, using a brief history of individuals contributing to this evolution over recent centuries. This is followed by the development of children’s hospitals which in Britain was half a century behind Europe. Following this Hospital for Sick Children in the next half century children’s hospitals developed in the main cities in Britain as clearly detailed by Lomax. 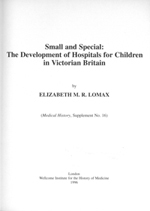 In her book - “Small and Special: Development of Hospitals for Children in Victorian Britain”. The history section gives a short history of paediatrics in Great Britain by Professor Dan Young.